As I write this report I am getting the feeling the 2015 fishing season is one that will have some incredible highlights. We have just rounded the middle of the season and there have been some incredible days of fishing and memories made. We can never be disappointed with where we live and how the Chilliwack area has been put on the map. Known as one a truly world class fishing destination. I truly love it here and love what our team gets to share each and everyday. Point in case was when one of our longtime clients and friends had their very first trip to the Fraser Canyon and trust me it won’t be their last up there. Peter was speaking about the fishing over the past 12 years with me and our team at GRFA – “Its more than the fish that get hooked when you fish with Great River.” Powerful words and I think we will be using this in our future adverts. Thanks for that Peter and your business for so many years! Now as you may have heard we are experiencing a very dry year so far and this can cause some hamper to our Salmon migrating upwards of 900 miles on the Mighty Fraser River. Water levels similar to 1998 and 1994, warm conditions just a little over 17C as of yesterday when I was in the Fraser Canyon chasing Dinosaurs. We can only hope that the cooling trend that came through for a few days will help and our Salmon will migrate fine to all their natal streams. 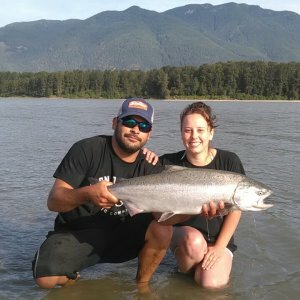 Salmon Fishing on the Fraser River is officially open as of August 3rd. 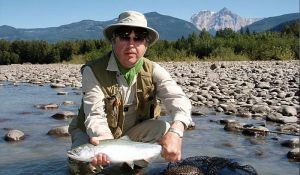 Selective methods allowed are fixed-rod, flyfishing, floatfishing and spoon fishing for Chinook Salmon (King) . 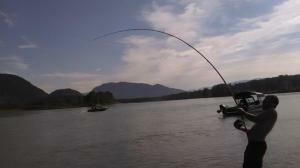 **DFO (Department of Fisheries and Oceans Canada) are asking for no one to be bottom bouncing on the Fraser River. If recreational anglers and guides want to keep this fishery open than we all need to adhere respect the rules and police our own fishery The older generation really enjoys bar fishing and we are now seeing a trend of younger fishers engaging in this social fishery. As a young man we did this as a family and it truly is a fun time and the fish are incredible. Big Chrome bright fish with sea lice usually and they fight hard. Our team is out testing the waters and the results have been good. Pink Salmon will be in the river in another few weeks and that should get the fishing really turned up a notch. The run size for the Pinks could be as high as 20 million fish and that is sure an incredible number to enjoy catching with the multiple methods. A real great fishery for families to learn fishing on and these fish will be around likely until October. We have fantastic sturgeon fishing right now and will continue throughout the entire year. This fishery is very strong and sustainable. I have not seen so many nice fish as we have seen this season. The GRFA team of guides continue to be dedicated to the mark recapture program and we are proud to say we collectively sampled 12,000 Sturgeon last year. All that with only 50 volunteers, wow! Also last year we have seen something that has never been seen in the past 20 years, we had over 350 large fish that we have not seen in 10 to 12 years. All likely a ocean migrating population that comes in with large runs of fish and are eating machine and then migrate back out to the ocean when the run dissipates and or in the late Fall and Winter months. A note on these is that most of these fish were between 6 and 9 feet. We can also boast that we have had a slight population increase in the past two years of sampling and that is also great news for the recovery of this long lived fish species. We are seeing excellent fishing on most every charter out and the range of baits this year have been widespread and slightly off the normal. I chalk this up to things like when the First Nation fishery is not present on the river in the early months – due to restrictions this season – the Sturgeon are not getting fed regularly and that makes them definitely not turned on to the Salmon meat and parts. We have been finding the fish are enjoying things like Lamprey, Eulachon, some roe, and Salmon heads if you have any in the freezer from the past year. Once you find what they are wanting that day you can really have get some good catching in. We are covering 225 KMS of river right now, from Vancouver to Sawmill creek in the Fraser Canyon and all of our key locations have produced great results. 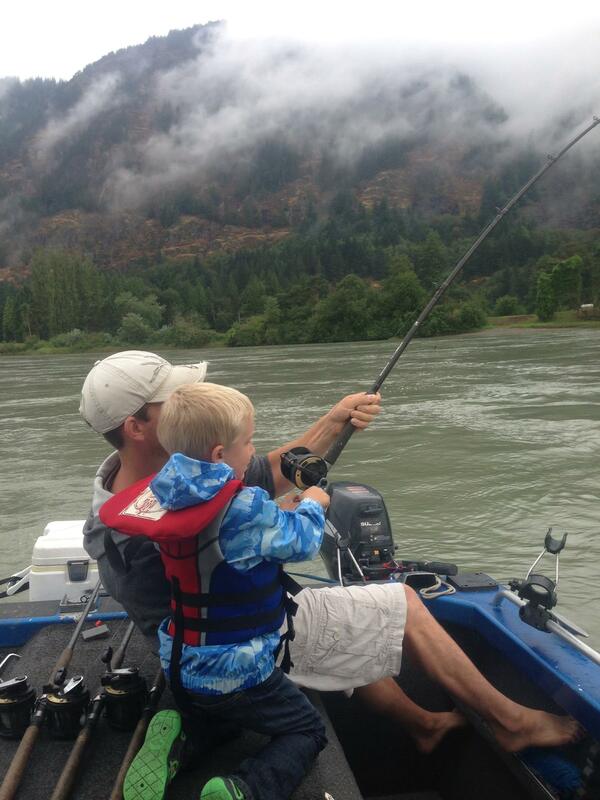 A very notable catch was 9 year old Kegan Rothman who fished with GRFA team guide Ben and landed a monster catch. That young fisher will never forget that day and the efforts Ben made to ensure he was able to tag this fish and record all the data for future years. Family fishing trips are fast becoming one of our most popular and it is so nice to have so many families out recreating together. So as you see it is not doom and gloom and the fish will come and I feel the river conditions will allow opportunity for many many anglers this season. Let’s not forget we have the Fall fishery too with the Chums and Coho, this is only just around the corner too. Finally I want to thank all of our clients, yes you! The ones that allow our amazing team of guides to go out and show you our area around Chilliwack and to make your dreams come true. The team of guides and office staff work relentlessly to try to make your experience the best it can be. We are all passionate about what we are doing and know that without you we would have “real jobs” and really – how much fun would that be. Our resource in our rivers is one of the best in the entire world and we are so thankful to have it in our backyard. Come visit, come fish with us we are truly the best fishing adventure team. Remember to keep our rivers and land clean and to respect nature and what it yields to us. The World visits our area and we want to showcase it the best we can – keeping it cleans tells them all we are proud of what we have here.